The UKF Group stocks one of the largest ranges of perforated exhaust tube in Europe. 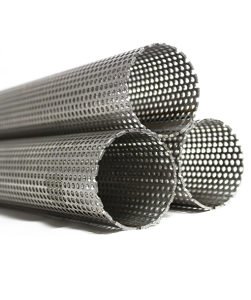 Our Perforated Exhaust Tube finds application with automotive exhausts and filtration systems. We offer standard 6011 pattern in Stainless Steel Grade 304 (1.4301) and Grade 409 (1.4512), from stock, in lengths up to 6 metres. Custom lengths and alternative patterns are available upon request.